Davis, our son, LOVES his wagon. So we knew we needed to use it in some way - so naturally we started to think of all the great movies with memorable vehicles. What is more memorable than the DeLoreon from Back To The Future. I built it from cheap plywood (18 bucks at Home Depot) and Spray paint - and we collected the rest of the outfits at various places online. 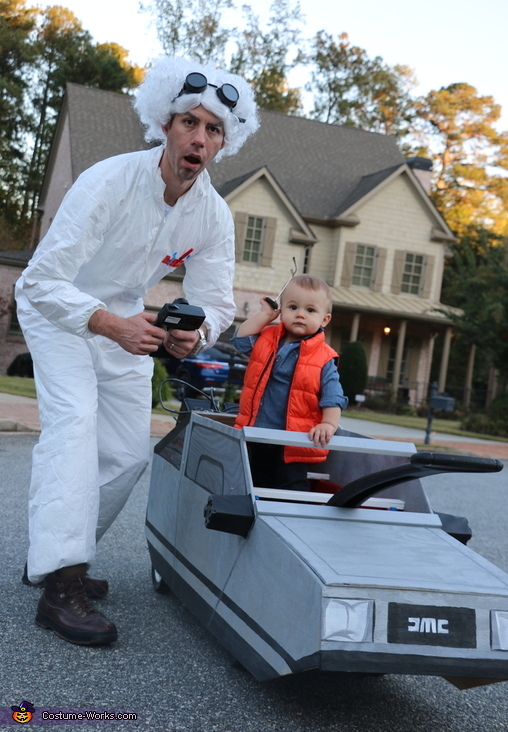 Dad naturally had to go as Doc, and Mom had to go as the girlfriend. We blasted Power of Love the entire evening, and everyone just loved it! Who doesn't love Back to the Future??? ?